Gary Edward "Garrison" Keillor (born August 7, 1942) is an American author, storyteller, humorist, voice actor, and radio personality. He is best known as the creator of the Minnesota Public Radio (MPR) show A Prairie Home Companion (called Garrison Keillor's Radio Show in some international syndication), which he hosted from 1974 to 2016. Keillor created the fictional Minnesota town Lake Wobegon, the setting of many of his books, including Lake Wobegon Days and Leaving Home: A Collection of Lake Wobegon Stories. Other creations include Guy Noir, a detective voiced by Keillor who appeared in A Prairie Home Companion comic skits. Keillor is also the creator of the five-minute daily radio/podcast program The Writer's Almanac, which pairs one or two poems of his choice with a script about important literary, historical, and scientific events that coincided with that date in history. In November 2017, Minnesota Public Radio cut all business ties with Keillor after an allegation of inappropriate behavior with a freelance writer for A Prairie Home Companion. On April 13, 2018, MPR and Keillor announced a settlement that allows archives of A Prairie Home Companion and The Writer's Almanac to be publicly available again, and soon thereafter, Keillor began publishing new episodes of The Writer's Almanac on his website. 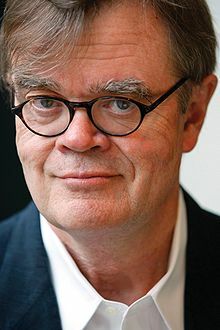 Keillor was born in Anoka, Minnesota, the son of Grace Ruth (née Denham) and John Philip Keillor. His father was a carpenter and postal worker who was half-Canadian with English ancestry; Keillor's paternal grandfather was from Kingston, Ontario. His maternal grandparents were Scottish emigrants from Glasgow. Keillor's family belonged to the Plymouth Brethren, an Evangelical Christian movement that he has since left. In 2006, he told Christianity Today that he was attending the St. John the Evangelist Episcopal church in Saint Paul, Minnesota, after previously attending a Lutheran church in New York. In his 2004 book Homegrown Democrat: A Few Plain Thoughts from the Heart of America, Keillor mentions some of his noteworthy ancestors, including Joseph Crandall, who was an associate of Roger Williams, who founded Rhode Island and the first American Baptist church; and Prudence Crandall, who founded the first African-American women's school in America. Garrison Keillor started his professional radio career in November 1969 with Minnesota Educational Radio (MER), later Minnesota Public Radio (MPR), which today distributes programs under the American Public Media (APM) brand. He hosted a weekday drive-time broadcast called A Prairie Home Entertainment, on KSJR FM at St. John's University in Collegeville. The show's eclectic music was a major divergence from the station's usual classical fare. During this time he submitted fiction to The New Yorker magazine, where his first story for that publication, "Local Family Keeps Son Happy," appeared in September 1970. A Prairie Home Companion (PHC) debuted as an old-style variety show before a live audience on July 6, 1974; it featured guest musicians and a cadre cast doing musical numbers and comic skits replete with elaborate live sound effects. The show is punctuated by spoof commercial spots for PHC fictitious sponsors such as Powdermilk Biscuits, the Ketchup Advisory Board, and the Professional Organization of English Majors (POEM); it presents parodic serial melodramas, such as The Adventures of Guy Noir, Private Eye and The Lives of the Cowboys. Keillor voices Noir, the cowboy Lefty, and other recurring characters, and provides lead or backup vocals for some of the show's musical numbers. The show airs from the Fitzgerald Theater in St. Paul. After the show's intermission, Keillor reads clever and often humorous greetings to friends and family at home submitted by members of the theater audience in exchange for an honorarium. Also in the second half of the show, Keillor delivers a monologue called The News from Lake Wobegon, a fictitious town based in part on Keillor's own hometown of Anoka, Minnesota, and on Freeport and other small towns in Stearns County, Minnesota, where he lived in the early 1970s. Lake Wobegon is a quintessentially Minnesota small town characterized by the narrator as a place "... where all the women are strong, all the men are good-looking, and all the children are above average." The original PHC ran until 1987, when Keillor ended it to focus on other projects. In 1989, he launched a new live radio program from New York City, The American Radio Company of the Air, which had essentially the same format as PHC. In 1992, he moved ARC back to St. Paul, and a year later changed the name back to A Prairie Home Companion; it has remained a fixture of Saturday night radio broadcasting ever since. 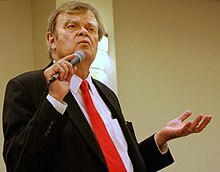 On a typical broadcast of A Prairie Home Companion, Keillor's name is not mentioned unless a guest addresses him by name, although some sketches feature Keillor as his alter ego, Carson Wyler. In the closing credits, which Keillor reads, he gives himself no billing or credit except "written by Sarah Bellum," a joking reference to his own brain. Keillor regularly takes the radio company on the road to broadcast from popular venues around the United States; the touring production typically features local celebrities and skits incorporating local color. In April 2000, he took the program to Edinburgh, Scotland, producing two performances in the city's Queen's Hall, which were broadcast by BBC Radio. He toured Scotland with the program to celebrate its 25th anniversary. (In the UK, Ireland, Australia, and New Zealand, the program is known as Garrison Keillor's Radio Show.) 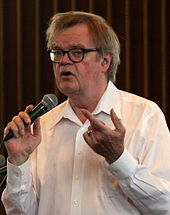 Keillor has produced broadcast performances similar to PHC but without the "Prairie Home Companion" brand, as in his 2008 appearance at the Oregon Bach Festival. He was also the host of The Writer's Almanac, from 1993 to 2017, which, like PHC, was produced and distributed by American Public Media. Keillor's final episode of the show was recorded live for an audience of 18,000 fans at the Hollywood Bowl in California on July 1, 2016, and broadcast the next day, ending 42 seasons of the show. After the performance, President Barack Obama phoned Keillor to congratulate him. The show continued on October 15, 2016, with Chris Thile as its host. Illness offers the chance to think long thoughts about the future (praying that we yet have one, dear God), and so I have, and so this is the last column of Mr. Blue, under my authorship, for Salon. Over the years, Mr. Blue's strongest advice has come down on the side of freedom in our personal lives, freedom from crushing obligation and overwork and family expectations and the freedom to walk our own walk and be who we are. And some of the best letters have been addressed to younger readers trapped in jobs like steel suits, advising them to bust loose and go off and have an adventure. Some of the advisees have written back to inform Mr. Blue that the advice was taken and that the adventure changed their lives. This was gratifying. So now I am simply taking my own advice. Cut back on obligations: Promote a certain elegant looseness in life. Simple as that. Winter and spring, I almost capsized from work, and in the summer I had a week in St. Mary's Hospital to sit and think, and that's the result. Every dog has his day and I've had mine and given whatever advice was mine to give (and a little more). It was exhilarating to get the chance to be useful, which is always an issue for a writer (What good does fiction do? ), and Mr. Blue was a way to be useful. Nothing human is beneath a writer's attention; the basic questions about how to attract a lover and what to do with one once you get one and how to deal with disappointment in marriage are the stuff that fiction is made from, so why not try to speak directly? And so I did. And now it's time to move on. In 2004 Keillor published a collection of political essays, Homegrown Democrat: A Few Plain Thoughts from the Heart of America, and in June 2005 he began a column called The Old Scout, which ran at Salon.com and in syndicated newspapers. The column went on hiatus in April 2010 so that he "... [could] finish a screenplay and start writing a novel." Voiceover artist for Honda UK's "the Power of Dreams" campaign. The campaign's most memorable advertisement is the 2003 Honda Accord commercial Cog, which features a Heath Robinson contraption (or Rube Goldberg Machine) made entirely of car parts. The commercial ends with Keillor asking, "Isn't it nice when things just work?" Since then, Keillor has voiced the tagline for most if not all UK Honda advertisements, and even sang the voiceover in the 2004 Honda Diesel commercial Grrr. His most recent ad was a reworking of an existing commercial with digitally added England flags to tie in with the World Cup. Keillor's tagline was "Come on, England, keep the dream alive." In Slate, Sam Anderson called Keillor "very clearly a genius. His range and stamina alone are incredible—after 30 years, he rarely repeats himself—and he has the genuine wisdom of a Cosby or Mark Twain." But Keillor's "willful simplicity," Anderson wrote, "is annoying because, after a while, it starts to feel prescriptive. Being a responsible adult doesn't necessarily mean speaking slowly about tomatoes." Anderson also noted that in 1985, when Time magazine called Keillor the funniest man in America, Bill Cosby said, "That's true if you're a pilgrim." The Simpsons parodied him in an episode in which the family is shown watching a Keillor-like monologist on television; they are perplexed at why the studio audience is laughing so much, prompting Homer to ask "What the hell's so funny?" and Bart to suggest "Maybe it's the TV." Homer then hits the set, exclaiming: "Stupid TV! Be more funny!" Two parody books by "Harrison Geillor": The Zombies of Lake Woebegotten and The Twilight of Lake Woebegotten, were published by Night Shade Books in 2010 and 2011. Keillor is a member of the Democratic-Farmer-Labor Party. He is 6 ft 3 in (191 cm) tall. He considers himself a loner and prefers not to make eye contact with people. Though not diagnosed, he also considers himself to be on the high-functioning end of the autism spectrum. He spoke about his experiences as an autistic person in his keynote address at the 19th Annual Minnesota Autism Conference in 2014. Keillor has been married three times. He was married to Mary Guntzel from 1965 to 1976; they had one son, Jason (born 1969). He was married to Ulla Skaerved, a former exchange student from Denmark at Keillor's high school whom he re-encountered at a class reunion, from 1985 to 1990. He married classical string player Jenny Lind Nilsson (born 1957), who is also from Anoka, in 1995. They have one daughter, Maia Grace Keillor (born December 29, 1997). Between his first and second marriages, Keillor was romantically involved with Margaret Moos, who worked as a producer of A Prairie Home Companion. In 2006, after a visit to a United Methodist church in Highland Park, Texas, Keillor created a local controversy with his remarks about the event, including the rhetorical suggestion of a connection between event participants and supporters of torture and a statement creating an impression of political intimidation: "I walked in, was met by two burly security men ... and within 10 minutes was told by three people that this was the Bushes' church and that it would be better if I didn't talk about politics." In response, the lecture series coordinator said the two "burly security men" were a local policeman and the church's own security supervisor, both present because the agreement with Keillor's publisher specified that the venue provide security. In addition the coordinator said that Keillor arrived at the church, declined an introduction and took the stage without an opportunity to mingle with the audience, so he did not know when these warnings might have been dispensed. The publicist concurred, saying that Keillor did not have contact with any church members or people in the audience before he spoke. Supposedly, before Keillor's remarks, participants at the event had considered the visit to have been cordial and warm. Asked to respond, Keillor stuck to his story, describing the people who advised him not to discuss politics and saying that he did not have security guards at other stops on the tour. I live in a small world – the world of entertainment, musicians, writers – in which gayness is as common as having brown eyes ... And in that small world, we talk openly and we kid each other a lot. But in the larger world, gayness is controversial ... and so gay people feel besieged to some degree and rightly so ... My column spoke as we would speak in my small world, and it was read by people in the larger world and thus the misunderstanding. And for that, I am sorry. Gay people who set out to be parents can be just as good parents as anybody else, and they know that, and so do I. In 2008, Keillor created a controversy in St. Paul when he filed a lawsuit against his neighbor's plan to build an addition on her home, citing his need for "light and air" and a view of "open space and beyond". Keillor's home is significantly larger than others in his neighborhood and it would still be significantly larger than his neighbor's with its planned addition. Keillor came to an undisclosed settlement with his neighbor shortly after the story became public. On November 29, 2017, the Star Tribune reported that Minnesota Public Radio was terminating all business relationships with Keillor as a result of "allegations of his inappropriate behavior with an individual who worked with him." In January 2018, MPR CEO Jon McTaggart elaborated that they had received allegations of "dozens" of sexually inappropriate incidents from the individual, including requests for sexual contact. Keillor has denied any wrongdoing and said his firing stems from an incident when he touched a woman's bare back while trying to console her. He stated he apologized to her soon after, that they had already made up, and that he was surprised to hear the allegations when her lawyer called. In its statement of termination, MPR announced that Keillor would keep his executive credit for the show, but that since he owns the trademark for the phrase "prairie home companion", they would cease rebroadcasting episodes of A Prairie Home Companion featuring Keillor and remove the trademarked phrase from the radio show hosted by Chris Thile. MPR also eliminated its business connections to PrairieHome.org and stopped distributing Keillor's daily program The Writer's Almanac. The Washington Post also canceled Keillor's weekly column when they learned he had continued writing columns, including a controversial piece criticizing Al Franken's resignation because of sexual misconduct allegations, without revealing that he was under investigation at MPR. Several fans wrote MPR to protest his firing, and within the month, 153 members had canceled their memberships because of it. In January 2018, Keillor announced he was in mediation with MPR over the firing. On January 23, 2018, MPR News reported further on the investigation after interviewing almost 60 people who had worked with Keillor. The story described other alleged sexual misconduct by Keillor, and a $16,000 severance check for a woman who was asked to sign a confidentiality agreement to prevent her from talking about her time at MPR (she refused and never deposited the check). Keillor received a letter from the MPR CEO, Jon McTaggart, dated April 5, 2018, confirming that both sides wanted archives of A Prairie Home Companion and The Writer's Almanac to be publicly available again. The archives were restored at the end of April 2018, to be hosted by MPR for no longer than three years per the agreement between Keillor and MPR, after which the archives will move to a new online home. In 2016, he received the Fitzgerald Award for Achievement in American Literature. Fiction A Christmas Story Dec. 25, 1989 40-42 A boy Jim, neglected by his plutocrat parents, runs away on Christmas eve with his ill dog. Fiction End of an Era Oct. 28, 1985 31-32 Fiction about his friends' reactions to the death of an aging hippie. Fiction What Did We Do Wrong? September 16, 1985 32-35 Fiction about Annie Szemanski, the first woman to play major league baseball. ^ Wadler, Joyce (June 7, 2006). "Where all the rooms are above average / Garrison Keillor's home not a little house on the prairie". The San Francisco Chronicle. San Francisco, California: Hearst Corporation. Archived from the original on April 14, 2012. ^ "Garrison Keillor sounds at home on CBC Radio". Pqasb.pqarchiver.com. February 26, 1996. Retrieved March 4, 2015. ^ "Ancestry of Garrison Keillor". Wargs.com. Archived from the original on March 8, 2015. Retrieved March 4, 2015. ^ "Grace Keillor, mother of Garrison, passes away at age 97 | State of the Arts | Minnesota Public Radio News". Minnesota.publicradio.org. July 27, 2012. Archived from the original on October 18, 2012. Retrieved March 4, 2015. ^ "From the Radio to the Big Screen". Christianity Today. June 5, 2006. Retrieved March 4, 2015. ^ "Press Room". Prairiehome.publicradio.org. Archived from the original on July 13, 2014. ^ Keillor, Garrison (April 15, 2010). "Post to the Host: 7th Grade Report". A Prairie Home Companion. Archived from the original on September 21, 2010. Retrieved September 5, 2010. ^ Keillor, Garrison (2004). Homegrown Democrat. New York: Penguin Books. pp. 39–40, 84. ISBN 978-0-14-303768-2. ^ Keillor, Garrison (2004). Homegrown Democrat. New York: Penguin Books. p. 84. ISBN 978-0-14-303768-2. ^ a b c Lee, J. Y. (1991). "Garrison Keillor: A Voice of America". Jackson, Mississippi: University Press of Mississippi. ISBN 978-0-878-054732. ^ "Keillor to Quit Daily Show, Others Leave KSJN". Minneapolis Tribune. Minneapolis, Minnesota: Star Tribune Media Company LLC. August 24, 1973. p. 14B. ^ Garrison Keillor, pp. 35, 85. University Press of Mississippi, 1991. ^ Keillor, Garrison (2001). In Search of Lake Wobegon. New York: Viking Studio. pp. 12–13. ISBN 978-0-670-03037-8. ^ "A Prairie Home Companion". A Prairie Home Companion. Archived from the original on November 15, 2016. Retrieved November 14, 2016. ^ "Oregon Bach Festival pressroom". Archived from the original on November 28, 2010. Retrieved August 17, 2009. ^ "Garrison Keillor, 'Prairie Home Companion' Host, to Retire From Radio". The Hollywood Reporter. March 17, 2011. Archived from the original on March 18, 2011. Retrieved March 30, 2011. ^ Miller, Bruce (December 1, 2011). "Garrison Keillor keeps the home fires burning". Sioux City Journal. Sioux City, Iowa: Lee Enterprises. Archived from the original on January 6, 2012. Retrieved January 22, 2012. ^ "Garrison Keillor to retire from 'Prairie Home' in 2016". New York Daily News. New York City: Tronc. Archived from the original on July 23, 2015. ^ "Garrison Keillor hosts final A Prairie Home Companion episode". The Guardian. ondon, England: Guardian Media Group. July 2, 2016. Archived from the original on October 4, 2016. ^ Justin, Neal (June 18, 2016). "Sun is setting on Garrison Keillor's time on Lake Wobegon". Minneapolis Star Tribune. Minneapolis, Minnesota: Star Tribune Media Company LLC. ^ Garner, Dwight (July 3, 2016). "Keillor turns out the lights on Lake Wobegon". The New York Times. New York City: New York Times Company. Archived from the original on October 15, 2016. ^ "Minnesota Author Biographies: Garrison Keillor". Minnesota Historical Society. Archived from the original on April 17, 2016. Retrieved September 11, 2016. ^ "In Search of Lake Wobegon @". Nationalgeographic.com. Archived from the original on December 11, 2007. Retrieved March 4, 2015. ^ Miller, Laura (September 4, 2001). "Every dog has his day". Salon.com. San Francisco, California: Salon Media Group. Archived from the original on January 26, 2011. Retrieved March 4, 2015. ^ "Liberal - Political". www.tmsfeatures.com. Archived from the original on November 13, 2008. Retrieved March 4, 2015. ^ Webb, Tom (December 2, 2011). "Keillor's bookstore outgrows St. Paul space and will move to Macalester College campus". St. Paul Pioneer Press. Archived from the original on October 4, 2013. Retrieved May 28, 2013. ^ "Common Good Books Opens at Macalester". Archived from the original on January 30, 2015. Retrieved January 29, 2015. ^ Craine, Tatiana (May 7, 2012). "Garrison Keillor's Common Good Books re-opens in new location". Citypages.com. Archived from the original on May 29, 2013. Retrieved May 28, 2013. ^ Anderson, Sam (June 16, 2006). "A Prairie Home Conundrum". Slate. Archived from the original on February 11, 2016. ^ "'SNL' Spoofs Garrison Keillor". WCCO-TV. November 20, 2011. Archived from the original on April 2, 2015. Retrieved March 27, 2015. ^ "I Want a Job Like Garrison Keillor's". Songaweek.com. November 13, 2003. Archived from the original on November 3, 2015. Retrieved March 4, 2015. ^ "Books by Harrison Geillor". Night Shade Books. Archived from the original on December 2, 2017. Retrieved February 8, 2016. ^ Powers, John (August 10, 2008). "Plenty of niceness, and no ice, for a Grand Old Party". The Boston Globe. Archived from the original on November 2, 2012. ^ "Garrison Keillor signs off". Archived from the original on June 27, 2016. ^ Thomalla, Kelly. 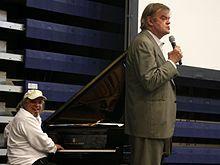 "Garrison Keillor opens 19th Annual MN Autism Conference". ausm.org. Archived from the original on August 3, 2016. ^ "19th Annual Minnesota Autism Conference: Garrison Keillor Unforgettable". blog.heidischauer.com. Archived from the original on June 23, 2016. ^ "Garrison Keillor and Jenny Lind Nilsson - Marriage Profile". Marriage.about.com. Archived from the original on April 2, 2015. Retrieved March 4, 2015. ^ "Garrison Keillor What He Did For Love". Chicago Tribune. February 12, 1986. Archived from the original on June 23, 2016. ^ a b Wadler, Joyce (June 1, 2006). "Where All the Rooms Are Above Average". The New York Times. Archived from the original on December 1, 2017. ^ "A Prairie Home Companion from American Public Media". American Public Media. January 2, 1998. Archived from the original on July 4, 2010. Retrieved December 24, 2010. ^ "Garrison Keillor". John Rosengren. Archived from the original on March 13, 2015. Retrieved March 4, 2015. ^ Walsh, Paul (September 9, 2009). "Minor stroke puts Keillor in hospital". Star Tribune. Archived from the original on June 7, 2011. Retrieved September 9, 2009. ^ Floyd, Jacquielynn (October 4, 2006). "Keillor's Dallas jabs read like fictional tale". Dallas Morning News. Dallas, Texas: A.H. Belo Corporation. Archived from the original on October 11, 2006. ^ Wilonsky, Robert (October 4, 2006). "And He Sounds Like Such a Nice Boy on the Radio ..." Dallas Observer. Dallas, Texas: Voice Media Group. Retrieved May 13, 2018. ^ Keillor, Garrison (March 14, 2007). "Stating the obvious". Salon.com. San Francisco, California: Salon Media Group Inc. Retrieved May 13, 2018. ^ Keillor, Garrison (March 21, 2007). "To the worker ants of science". Salon.com. San Francisco, California: Salon Media Group Inc. Archived from the original on June 29, 2008. Retrieved March 4, 2015. ^ Nizza, Mike (February 26, 2015). "Garrison Keillor Leaves Home for Greener Prairies". The New York Times. New York City: New York Times Company. Retrieved March 4, 2015. ^ Lonetree, Anthony (January 23, 2008). "Mediation ends Keillor's feud with neighbor". Star Tribune. Minneapolis, Minnesota: Star Tribune Media Company LLC. Archived from the original on April 2, 2015. Retrieved March 4, 2015. ^ Keillor, Garrison (December 16, 2009). "Garrison Keillor Christmas | Nonbelievers, please leave Christmas alone". Baltimore Sun. Tronc. Archived from the original on March 20, 2015. Retrieved March 4, 2015. ^ Landrum, Cynthia (December 17, 2009). "Rev. Cyn: Garrison Keillor Is no "Companion" for Unitarian Universalists". Revcyn.blogspot.com. Archived from the original on December 27, 2014. Retrieved March 4, 2015. ^ Jacoby, Jeff (December 27, 2009). "Musings, random and otherwise". Boston Globe. Boston, Massachusetts: Boston Globe Media Partners, LLC. Archived from the original on December 21, 2014. Retrieved March 4, 2015. ^ a b Yuen, Laura; Sepic, Matt; Kerr, Euan (January 23, 2018). "For some who lived in it, Keillor's world wasn't funny". MPR News. St. Paul, Minnesota: MPR. Archived from the original on January 23, 2018. Retrieved January 23, 2018. ^ "Minnesota Public Radio statement on the firing of Garrison Keillor". Minneapolis Star Tribune. Minneapolis, Minnesota: Star Tribune Media Company LLC. November 29, 2017. Archived from the original on December 1, 2017. Retrieved November 30, 2017. ^ Baenen, Jeff. "Garrison Keillor firing prompts backlash from fans; MPR reports 1 formal complaint". Chicago Tribune. Chicago, Illinois: Tronc. Retrieved January 16, 2018. ^ Ohlheiser, Abby; Zak, Dan; Fisher, Marc (November 29, 2017). "Garrison Keillor, founder of 'A Prairie Home Companion,' fired after allegations of improper behavior". The Washington Post. Washington DC: Nash Holdings LLC. ISSN 0190-8286. Retrieved January 16, 2018. ^ Baenen, Jeff (January 8, 2018). "Keillor in mediation with Minnesota Public Radio over firing". The Washington Post. Washington DC: Nash Holdings LLC. ISSN 0190-8286. Retrieved January 16, 2018. ^ Yuen, Laura; Kerr, Euan (April 13, 2018). "MPR-Keillor deal preserves Prairie Home, Writer's Almanac archives". MPR News. MPR. Retrieved April 16, 2018. ^ a b c d "Something for Everyone". School of the Arts: University of North Carolina. Archived from the original on July 25, 2011. Retrieved April 26, 2011. ^ "Index". Museum.tv. November 9, 2014. Retrieved March 4, 2015. ^ "Welcome to Minnesota - Minnesota Historical Markers on". Waymarking.com. Archived from the original on April 2, 2015. Retrieved March 4, 2015. ^ "Steinbeck Award 2007: Garrison Keillor". Steinbeck Review. 2007. pp. 88–92 – via https://muse.jhu.edu/article/236580. Cara Buckley, "The Garrison Keillor You Never Knew," New York Times, June 16, 2016.